with beautiful fragrant white flowers and numerous red stamens. It is a native of South Korea and Japan and it is likely that it was introduced by Messrs Veitch around l879. Magnolia liliiflora nigra has tulip like flowers which gradually open and are purple on the outside and creamy white on the inside. It was introduced in 1861 by JG Veitch from Japan. 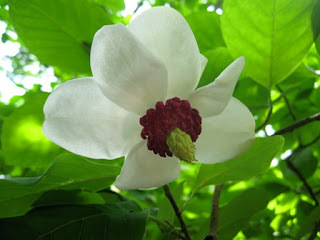 Magnolia hypoleucha, now obovata, is a large evergreen tree, sometimes 100 feet in height, with large scented creamy white flowers. It is a native of Japan and was introduced in 1884. 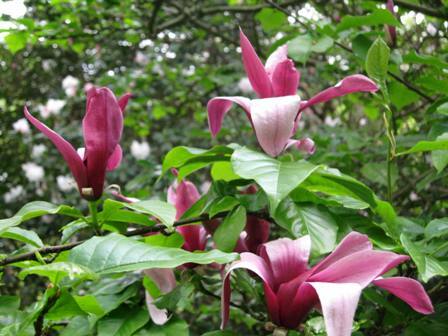 There are several large trees in gardens such as Savill Garden, Kew and Trewidden in Cornwall.